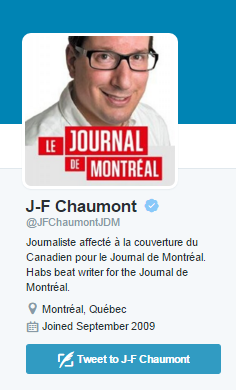 Hockey is a big deal in Canada, clearly, and reporters who write about it become household names. Using Cision Social Edition we monitored the hashtags #Hockey and #NHL January 18 and January 20, to find reporters, bloggers and broadcasters that hockey fans should follow. These media professionals break news, engage with fans and share their insights daily. 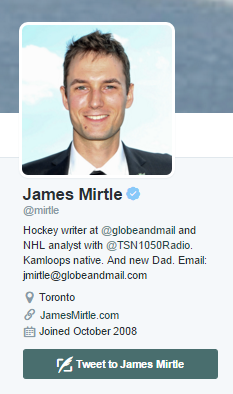 Here’s our list of the 17 Canadian NHL reporters a true hockey fanatic should follow. 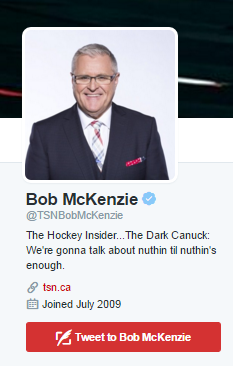 Bob McKenzie is the host of TSN’s long running show The Hockey Insider. Before entering broadcasting, McKenzie struggled to break into NHL Hockey writing, resorting instead to taking a job as Editor-in-Chief of the Hockey News. Successful work there landed him is dream job in 1991 as a columnist on NHL hockey with the Toronto Star. 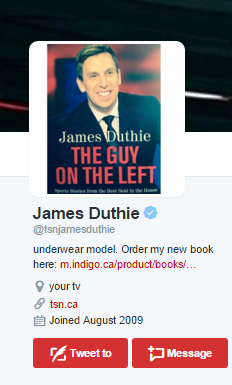 James Duthie is a sports reporter, television host with TSN, and a sports historian who has written three books. What sets Duthie apart is his comedic style, which he often employs in rich-broadcast featurettes such as TSN’s spoof of the Hangover film franchise that has Duthie wake up in Los Angeles clueless about how he ended up there without his broadcast partners. 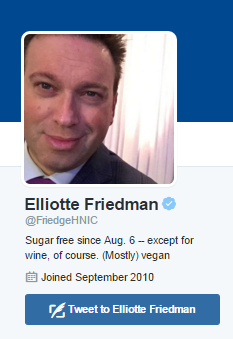 Elliotte Friedman is a sports broadcaster currently working with Sportsnet as author of the 30 Thoughts column and video series. 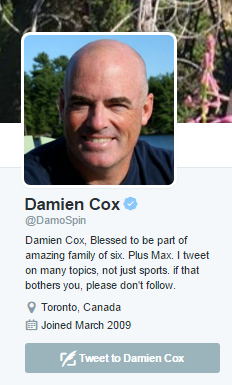 Damon Cox is a sports columnist for the Toronto Star, broadcaster for Sportsnet and has written about the Maple Leafs for 22 (arguably painful) years. Cox is also the author of three books on hockey including co-authoring the auto-biography of goalie Martin Brodeur, and The Maple Leafs, Their Sensational Victory, and the End of an Empire which chronicles the rise and fall of the Maple Leafs. 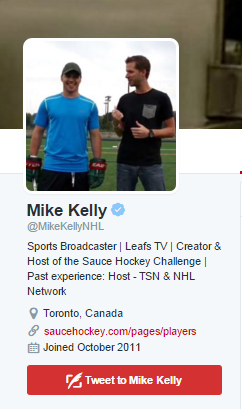 Mike Kelly is an on air personality with Leafs TV and hosts a podcast called Chip and Chase, referring to a scoring strategy in hockey. 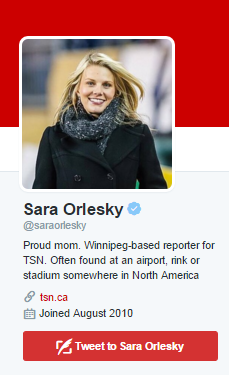 Sara Orlesky is a Winnipeg-based reporter for TSN who writes about the lives of the Winnipeg Jets both on and off the ice. She also follows the CFL and international ice-skating. 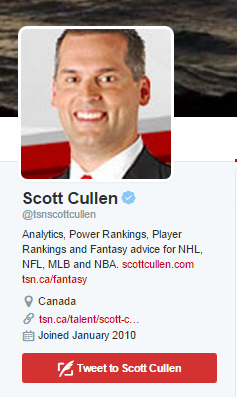 Scott Cullen is Canada’s Moneyball fantasy sports advice columnist uses analytics in his Want to impress your buddies in your fantasy draft? Read Scott’s articles on TSN. 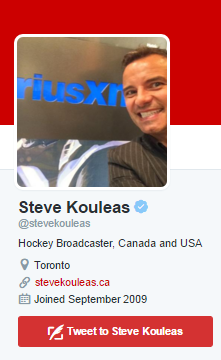 Steve Kouleaus is a Toronto-based hockey broadcaster and XM Radio host with more than 25 years of broadcast experience covering more than 10,000 hockey broadcasts, according to his website. 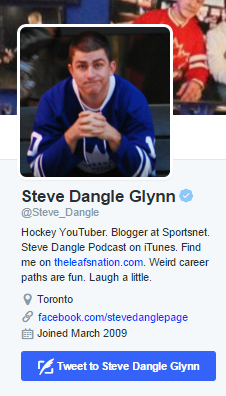 Hockey YouTuber Steve Dangle produces content for Leafsnation.com and hosts an eponymous podcast. He is also an enormous Leafs fan, send him flowers. 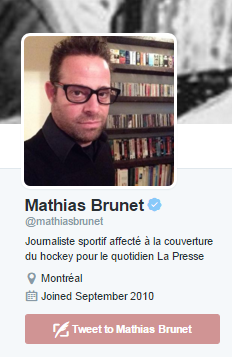 Mathias is a sports reporter based out of Montreal who works with La Presse and writes about statistics and hockey history. 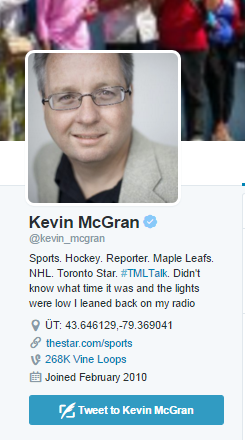 McGran is a sports and hockey reporter with The Toronto Star who’s Twitter persona shares its bias against the Montreal Canadiens and for the Maple Leafs. Jean-Francois writes about the Montreal Canadiens for le Journal de Montreal and writes with an equal love and skeptisim about the team that his home province holds dear. 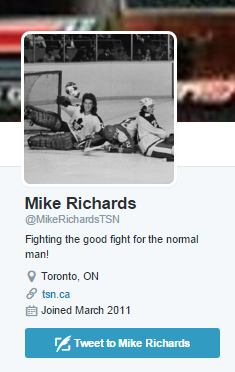 Mike Richards is a radio and TV host with TSN. Last year Richards spoke about a cancer diagnosis that pulled him off the air — today he’s back to his feisty self and advocating that more men should be screened for colorectal cancers. 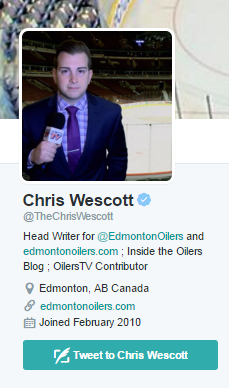 Chris Westcott is the head writer for the Edmonton Oilers – looks to him for the inside scoop on Edmonton’s favourite hockey team. 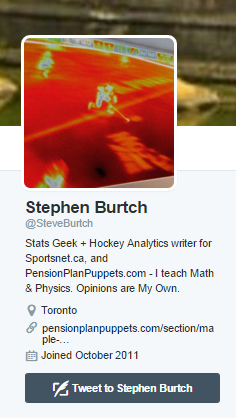 Stephen Burtch is a statistician and writer with Sportnet.ca. He also teaches math and physics! 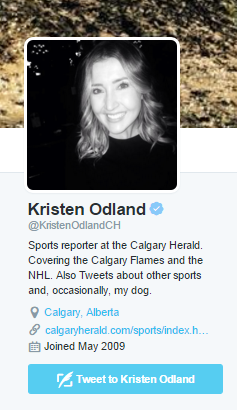 Kristen Odland is a sports reporter with the Calgary Herald who covers the Calgary Flames and occasionally tweets about her dog. Want to find more sports journalists and influencers in Canada? 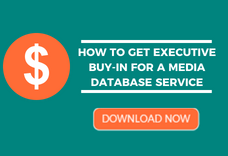 Learn how to build your own influencer list with our media database. How Will a Corporate Blog Benefit my Business?